Faster than an electric food processor, and more powerful than a regular knife. This chopper doesn't have super human abilities, but it will amaze and delight with it's simple and effective operation. A quick tug will cause the blades to spin rapidly, and reduce any food to evenly sized chunks. The number of tugs will determine how small the pieces are, so a few pulls will make coarsely chopped pieces, and a few more will cause them to become proportionately smaller. Keep on tugging, and any food inside the container will finely mince, and then puree together. 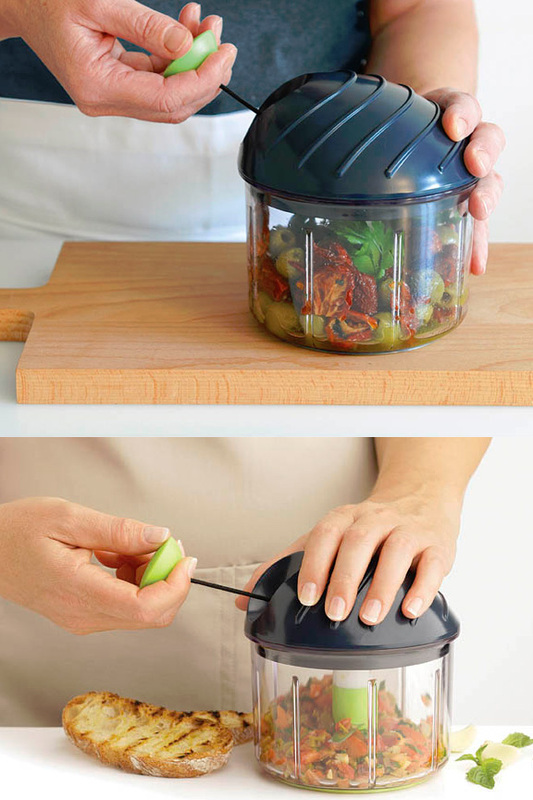 It comes complete with an additional storage lid, and an optional scraper that can attach to make smaller foods like cloves of garlic easier to chop. Extremely sharp, stainless steel blades are mounted in tandem to the rod at the center, and a plastic guide sits above them to force food downward. Just pull back to chop with speed and accuracy, and you can dice vegetables, prepare salads, or mix fresh salsa in seconds. Use the guide below to determine how many pulls will be required to get the results you want. 5-6 - Course, chunky cut. 7-12 - Medium to fine cut. 13-20 - Fine to very fine cut. 20+ - Very fine to puree. Perfect Size. Puree, fine, medium or course. This tool can do it all. Select the output size by increasing or decreasing the number of pulls. More Power. The spinning blades rotate rapidly to increase your cutting power. Sharp edges glide through food and chop with incredible accuracy. High Speed. Way faster than cutting with a knife, but also faster than plug in contraptions with large price tags. Cut multiple times with a single pull. Deluxe Features. 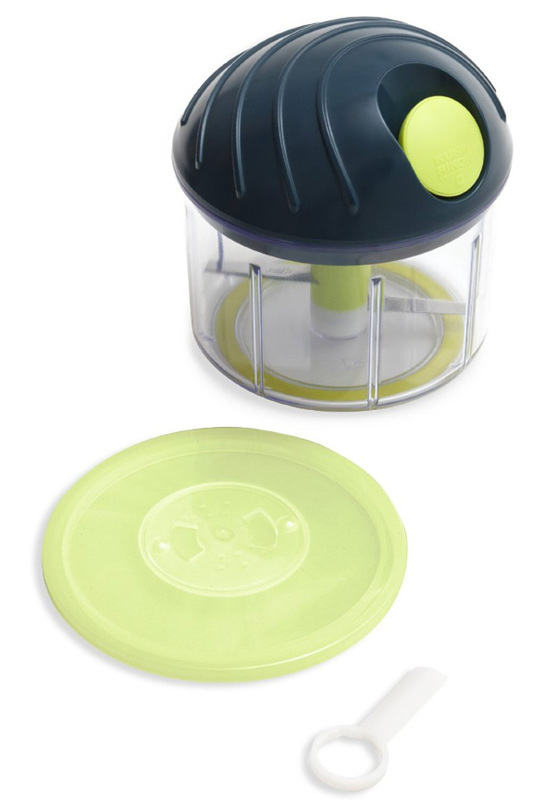 Complete with an extra lid for storing ingredients in the fridge, and a scraper attachment that goes under the blades to make small stuff easier to work with. Safety First. 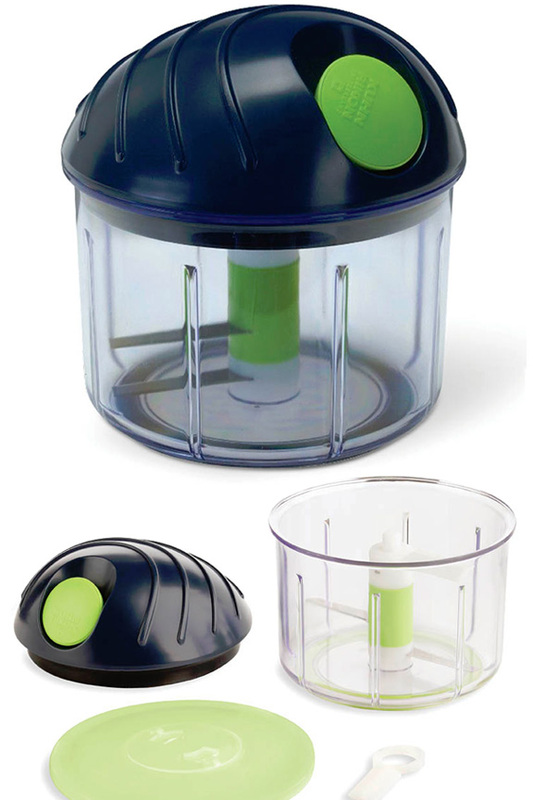 A non-slip base prevents movement, and a plastic cover protects the blade when not in use. These features help to avoid accidents and keep your fingers intact. Top Quality. Designed in Switzerland and manufactured using high quality components. The Chop Chop will work like a champ, and last for the long haul. Anything you would normally chop by hand, or run through a food processor can be prepared with this tool. It won't slice or julienne, but it will chop, mince, dice and puree. Use the list below as a guide to get started, but try on anything else that is similar too. Prep fruit for jams and sauces. Cut vegetables for soups, salads and stews. Mix and chop egg salad for sandwiches. Create fresh Salsa, pico or guacamole. Create meat chunks for soups or chili. Mince fresh cloves of garlic to add to any dish. Anyone can use this tool. If you can pull a cord, you can chop with precision, and there is no technique to learn. The simple action multiplies your effort and guarantees uniformity, so any skill level can accomplish amazing things. Set up is as easy as inserting the blades. They install at the center. For small foods, you can also attach the scraper at the bottom prior to putting the blades in place. Select ingredients, cut into smaller chunks if necessary, and then add to the bowl. For best results, do not overload. Once filled, secure the lid on top by twisting it in place. Use by grabbing the cord with one hand, and steadying the container with your other hand. Pull back to chop. The blades will spin rapidly, and the number of pulls will determine the size of your finished product. 5 pulls will produce a course chop, 10 will reduce to a medium size, and 14 will finely chop. Keep pulling to puree. Once finished, carefully open lid and remove food to use or serve. Avoid contact with the cutting edge, and use a spatula to make removal easier. Use the included storage lid to keep things for later if desired. Hand washing is best, bu the container is top rack dishwasher safe as well. Chop up a single ingredient, or or use it to cut and mix in one easy step. Dimensions 5" x 5" x 6"
Uses Chop, mince, mix, dice, puree, etc. A chopping tool that works as good as it looks. Achieve surprising accuracy and uniformity with this great gadget. 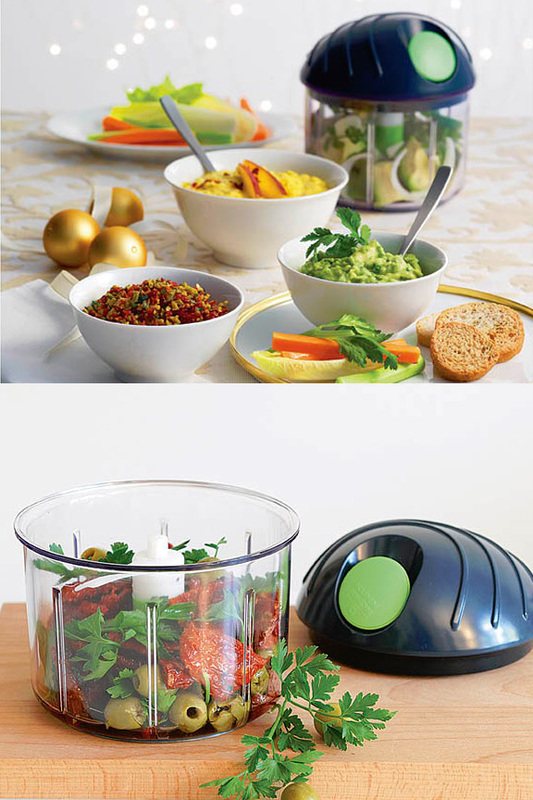 From course to fine, cut any food with speed and precision. Order Yours Today! My husband bought this for me because he felt so bad that I teared so much chopping onions. I LOVE this product. It works great and have used it for at least 3 years now. I am recommending it to a friend. I just watched the entire video and never once did you see anything being chopped. Not a good demo when nothing is being prepared.